The buckminsterfullerene molecule has sixty carbon atoms (green spheres) forming a “soccer ball” polyhedron. These molecules were named after architect Richard Buckminster Fuller due to their resemblance to his famous geodesic domes. Fuller’s domes are also based on spheres built from hexagons and pentagons, and he discovered that these shapes naturally distribute forces and tensions evenly throughout the structure, thus enabling light, sturdy, and enormous constructions, such as the Climatron in St. Louis or the Montreal Biosphère. Mathematically, a fullerene is a convex polyhedron where all faces are either hexagons or pentagons (these need not be regular), and 3 faces/edges meet at each vertex. The smallest of these mathematical fullerenes is the regular dodecahedron, which has no hexagons at all. The next smallest has two hexagons separated by twelve pentagons. Left: The smallest fullerene polyhedron is the dodecahedron, with 20 vertices and 12 pentagons. Right: The next smallest fullerene is the hexagonal truncated trapezohedron, having 24 vertices, 12 pentagons, and 2 hexagons. Large and unwieldy fullerenes also exist. Some are highly symmetric with pentagons arranged at the corners of an icosahedron; others form long tubes of hexagons closed at the ends; still others display very little discernible structure whatsoever. 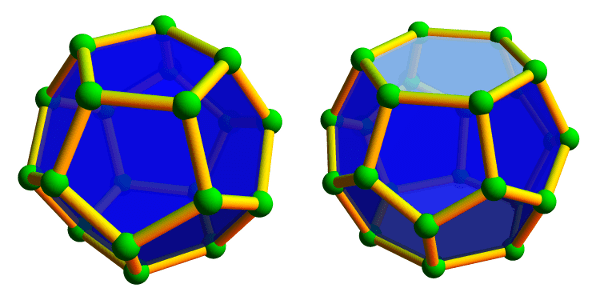 Left: A larger, icosahedrally-symmetric fullerene with 140 vertices and 72 faces. Middle: A tube-like fullerene with 66 vertices and 35 faces whose center is formed by a long spiral of hexagons. Right: a highly asymmetric fullerene with 44 vertices and 24 faces. 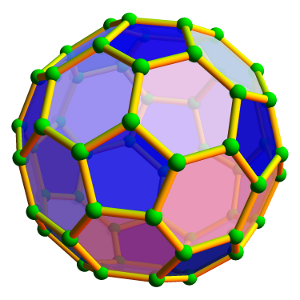 All fullerenes have exactly 12 pentagons! One explanation comes from Euler’s beautiful formula that relates the number of vertices, edges, and faces in a polyhedron. This formula says, quite simply, that if there are v vertices, e edges, and f faces in any convex polyhedron (not necessarily a fullerene), then \(v-e+f=2\), always! For example, a cube has 8 vertices, 12 edges, and 6 faces, and indeed \(8-12+6=2\). which indeed simplifies to \(p=12\). So there are always 12 pentagons in a fullerene, but how many hexagons can be present? The two smallest examples tell us that 0 or 2 hexagons are possible, but 1 is not. Can we get 3 hexagons? (Yes. Try this!) What about 33 hexagons? (Harder, but yes. Try this too!) In fact, any number of hexagons is possible, with the one exception we’ve already mentioned. See if you can prove this! Furthermore, the number of possible fullerenes grows rapidly as the number of hexagons grows. For example, there are 1812 different fullerenes that, like the soccer ball, have exactly 20 hexagons or, equivalently, 60 vertices. With 50 hexagons (120 vertices), this number jumps to more than 52 billion different fullerenes! Has anyone ever figured-out the most satisfactory symmetrical way of numbering the 32 faces of the “soccer-ball” type fullerene (i.e. Dodecahedron plus Icosahedron) in the manner of dice? Gaming dice tend to take the form of one of the platonic solids (tetrahedron, hexahedron(cube), octahedron, dodecahedron and icosahedron) commonly the d4, d6, d8, d12, and d20 respectively. This is because each face has the same geometry, which means it has the same probability of landing on any given side. As to the first part of your comment I believe the “soccer ball”type fullerene that’s the most satisfactorily symmetric would be the pattern that you actually see on a soccerball as it us icosahedrally symmetric, which if I’m not mistaken means it has 60 different orientations where the geometry is the same.